Meet the real-life mermaid who holds her breath for four and a half minutes while swimming to the ocean’s depths to swim among incredible sea creatures and wreckages. Julia Wheeler, 31, from Perth, Western Australia, has been a hand’s reach away from pilot whales, Bull sharks, manta rays and more during her time diving without any breathing equipment. As a child, she was fascinated by the Little Mermaid, dreaming she could be just like Ariel and from the age of five practiced holding her breath in the bath. She took a freediving course nearly ten-years-ago to become an underwater photographer but after entering Australian Freediving Nationals in Indonesia competition last year she qualified for the Wold Championships in Honduras. Since then she’s been photographed exploring the ocean’s depths from the Solomon Islands to Tahiti, swimming among sea creatures as well as fighter jets and ships claimed by the sea. She says is more comfortable in the water than on land and her incredible photographs, have led her to be dubbed a real-life mermaid. Julia, a professional photographer and free-diver, said: “When I was really young I loved holding my breath in the bath, at school I loved swimming and living on the coast I was always in the ocean. “I grew up watching Ariel and always wanted to be a mermaid, it’s a cheesy notion but it captured my imagination and I spent a lot of time in the water. “When I started diving I found swimming with breathing apparatus really strange, so I did a freediving course and became obsessed. “Since then I’ve dived down into the deep with whales, sharks, manta rays and more, I feel a part of their world when down there with them. “In the ocean, I feel more alive than I do on land, all your senses feel so alert – I feel in touch with everything going on around me. “To me, to feel alive is to be completely vulnerable and open to everything going on around you. “It’s a really incredible feeling with thousands of fish around you, you feel like a part of the ocean, it’s so uplifting and makes me feel so happy. “Part of freediving means you can spend a little more time in certain place and feel like part of the ocean. “It gives you the ability to explore marine life, and the skeletal remains of shipwrecks that send my mind into wonder. 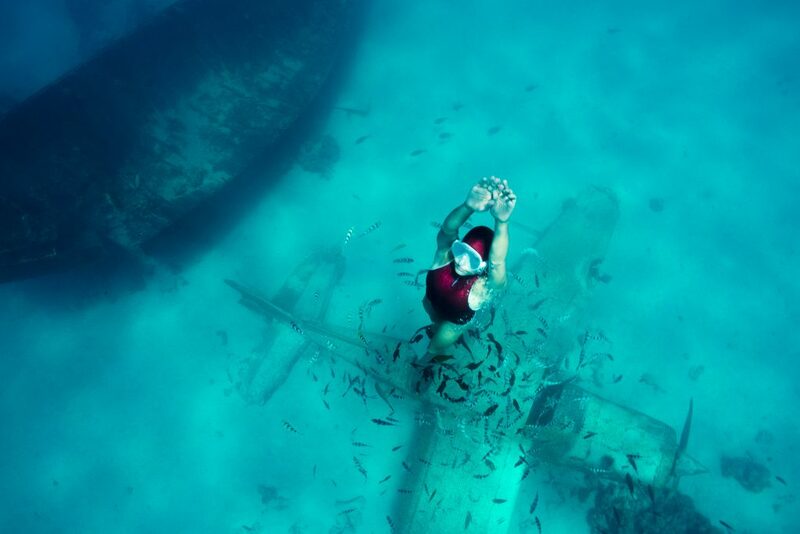 “It is such an honor to be able to experience the beauty of WWII wrecks – something that was once in another atmosphere and now gifted to the depths of the ocean. “In one breath, I could swim down and cruise around the structure, take it all in, it’s invigorating and one of the coolest feelings. “I once dived down to a bomber plane from World War Two, the aircraft was 25metres down below, looking down at the skeleton of it from the surface was intimidating. 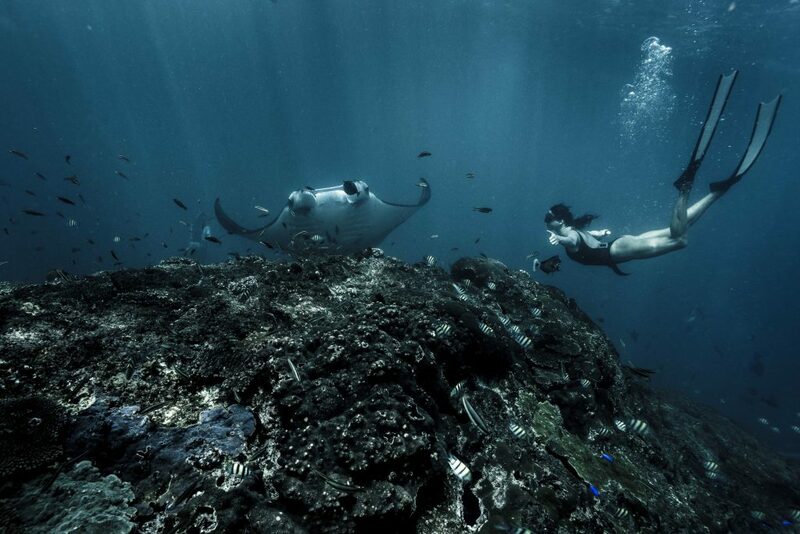 Julia says that in her near ten years of freediving she’s not been overly fearful of the creatures swimming around her. She added: “It’s the awesome and best feeling in the world, you never know what will happen or is coming around the corner, there’s a special thing about being vulnerable while in the sea. “I’ve swam with Bull sharks, Bronze Whalers and Tiger Sharks – they are the coolest creature because they are so beautiful to swim with, despite this they are unfairly thought of as man-eaters, where they really aren’t. “The nature of a shark is so graceful and beautiful, it’s a pleasure to swim around them under the water. “I have even swam around a five-metre tiger shark and not been scared, I was completely awestruck and loved every moment. “I did a dive with pilot whales, they are carnivores and have a reputation for being protective so I was a little nervous around them but when you enter the water, you are entering their domain at your own risk. Julia is regularly quizzed by strangers about her profession with many people unable to believe that she free-dives professionally. Julia said: “People are fascinated by what I do, they always have questions like and say things like ‘Oh my god, I would die’. “I can’t stay longer than four and a half minutes, but we all have the ability to hold our breath for long periods of time. Julia, who is an animal and environmental activist, hopes to change people’s habits to protect and reduce the amount of damage done to the earth. She hopes her incredible aquatic images will change people’s perceptions and help them to appreciate the beauty of the ocean. Julia said: “People need to know how much waste we produce and if we don’t change our ways it will be too late, all of our waters will be ruined. “There are over five billion particles of plastic in the ocean, everyone can do their own little bit to preserve the environment. Womb for rent: Meet the mum of two who loves being pregnant so much she wants to become a surrogate!